Answering the call is a Warrior’s finest attribute and it’s exactly what North Geelong did against Dandenong City last weekend with a polished 2-0 win at home. The win boosts the Warriors after two losses and a three-point deduction by the football federation for an on-pitch indiscretion that spilled into the supporter area during round 16. With all that past, the Warriors can now set their sights on tackling Eastern Lions away on Saturday in another cross-conference fixture. The Lions are renowned for providing a strong physical contest but also for disrupting the flow of sides, as they did last week against Moreland Zebras in an away 2-1 win. The Warriors will need to tame Cameron Neales and Casey Thomas, who have lately formed a partnership likened Darius Madison and Jamie Noggler. North Geelong will be buoyant after toppling Dandenong City with a steely resolve to hold firm and remain calm when not in possession but also dynamic and swift when going forward. Ryan Opperman’s selection remains in doubt after he was at the centre of everything in last week’s first half before coming off with hamstring tightness. The form of forwards Madison and Noggler is continuing to reap rewards, with the latter scoring two goals in either half to seal last weekend’s victory. 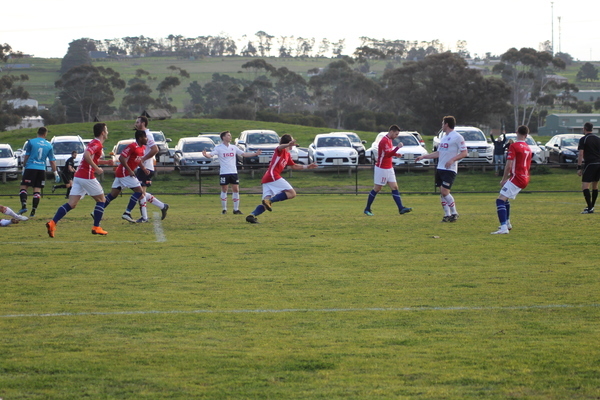 The first goal began with an incisive run where Noggler zipped past three opponents. His first two strikes were saved but he slammed his third attempt to open the lead. The second goal followed a counterattack where Madison rolled his opponent but the ball wouldn’t fall for him to strike. Madison then smartly dragged two opponents away from goal, opening the avenue for Noggler to run through and drive it neatly on the inside of the post. The under-20s continued their undefeated streak to five games now with a 2-2 draw on the weekend, with goals to Daniel Gudasic and Gabriel Majic.